This photograph is from the Froude Avenue Community Centre webpage. 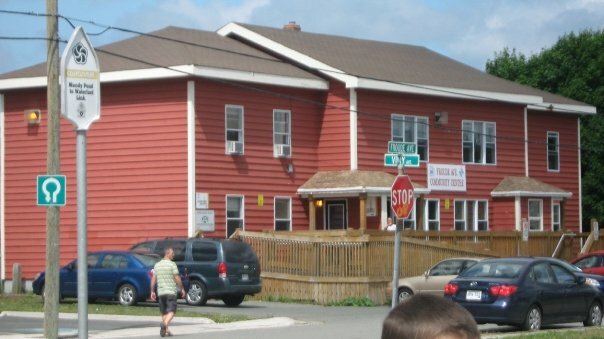 The Newfoundland and Labrador Housing Corporation began a Tenants Relations Programme in 1983 in order to improve communications between the tenants and the landlord and to encourage involvement in the neighbourhood. There are now 34 tenants associations in Newfoundland and Labrador. It quickly became clear that community centres were needed to encourage involvement in the neighbourhood. In 1985, the Froude Avenue Community Centre was the first to be opened. In St. John’s four more community centres were opened in the larger housing developments of Rabbittown, Virginia Park, Buckmaster’s Circle, and Brophy Place. These centres have paid staff to manage the operation and coordinate programming. Smaller public housing developments have neighbourhood centres, which are run by volunteers. The aims of the community centres are to: encourage the involvement of tenants in their housing projects through the use of programmes and activities implemented through the centre; create a positive atmosphere, community spirit and co-operation; and help develop a better social environment by providing recreational, educational and social programs, as well as training and referrals. Activities at the community and neighbourhood centres are available for all ages. These range from Healthy Baby clubs and pre-school play groups to homework, reading and craft clubs for older children, youth empowerment programmes for teens, craft clubs for adults and activities for seniors. Training programmes are available through the community centres. What has become clear through the activities of these centres is that the residents of public housing neighbourhoods are people of ability and capacity and that our society has need of their contributions to the broader community.